“Call me Tedros,” the newly elected director-general (DG) of the World Health Organisation (WHO), Dr Tedros Adhanom Ghebreyesus, told a Chinese reporter at a press conference held after he was elected on May 23. “The issue is: in Ethiopia we don’t have surnames, and also my wife or my partner doesn’t take my name,” he said explaining why he ran his campaign for the post of the DG with ‘Dr Tedros’ instead of using his surname. Tedros became the first African to head the UN’s health agency in its 69-year-old history. He was selected after a tense election that ran into three rounds defeating British candidate and former special envoy of the secretary-general on Ebola David Nabarro and former Pakistani health minister Sania Nishtar. The World Health Assembly (WHA) this time saw two firsts: the first time that an African became the head of the globe’s biggest public health agency and also the first time that there was an election to choose the DG through a secret ballot. Previously, the all-powerful executive board (EB) of the WHO – comprising 34 member states elected for the tenure of three years each – made the decision in closed-door meetings and pushed it forward to a mere rubber stamping by the rest of the members. This had led to all sorts of allegations being levelled against the UN agency. In a bid to bring about some measure of transparency – though critics have said that this is not enough – in selecting for this crucial position it was decided that large and small governments alike could choose their candidate through a one-country-one-vote system. But before that, the candidates – of which there were six initially – had to face intense public scrutiny through interactions between them and voting governments that were webcast publicly. The names of candidates for the next DG nominated by member states were announced on September 23 last year with French candidate Philippe Douste-Blazy, Italian Flavia Bustreo, former Hungarian health minister Miklós Szócska, Ethiopian Tedros Adhanom Ghebreyesus, Nabarro and Nishtar making it to the coveted list. In October 2016, these candidates were given the opportunity to interact with governments in a password-protected web forum hosted by WHO. On November 1 and 2, 2016, a live forum was held, at which candidates presented their vision and answered questions related to their candidacy – this was live webcast. In January 2017, the EB drew up a short list of five candidates, which after interviews was winnowed down to three, pushing these names for the final elections at the 70th WHA. There was rigorous campaigning for more than a year with contenders crisscrossing the globe for garnering support. Nabarro declared meeting more than 100 health ministers while Nishtar travelled on a near-impossible mission to New Delhi to ask for their support for her candidature. “As you have heard before, while WHO has never had a director-general from Africa, no one should elect me because I am from Africa but if you agree there is real value in electing a leader who has worked in one of the toughest environments and transformed the health system, who can bring a fresh perspective, an angle with which the world has never seen before,” Tedros said in a speech to the WHA at a plenary session just before the election the evening of May 23. However, Tedros did have the support of the African Union (AU), counting for quite a number of votes, because he is an African as well as the support of the Pacific and Caribbean countries. After his victory, Ethiopia’s permanent representative to the UN in Geneva Negash Kebret Botora said, “It’s a victory day for Ethiopia and for Africa.” Ethiopians, and others from Africa, were seen rejoicing near the Broken Chair monument outside the Palais des Nations. It is not certain how Indian health minister JP Nadda, who was leading the Indian delegation at the WHA, pressed the vote button. But one can make a fair guess. It is highly improbable that India would vote for Pakistan – given the terrible relations between the two neighbours at the moment – for heading a UN agency that peddles such huge influence globally. It is also improbable, though to a lesser degree, that Nadda would have voted for Nabarro who was not as vocal with his support for the controversial report of the UN High-Level Panel on Access to Medicines (UNHLP), the findings of which India vociferously supports and western countries like the UK and the US denounce. Tedros was more supportive both of the UNHLP findings as well as countries using compulsory licensing to produce more generic medicines (though Nishtar was the most vocal of the three on these issues). In the first round of contest among the three final candidates, Tedros got 95 votes, while Nabarro got 52 votes and Nishtar had 38 votes. Since Tedros did not get a clear two-third majority, the two candidates with the highest votes got pushed to the second round while Nishtar dropped off the list. In the second round, Tedros got 121 votes – just one vote short of the two-third majority required – while Nabarro got 62 votes, requiring a third round of voting where only a simple majority was enough to clinch the deal. 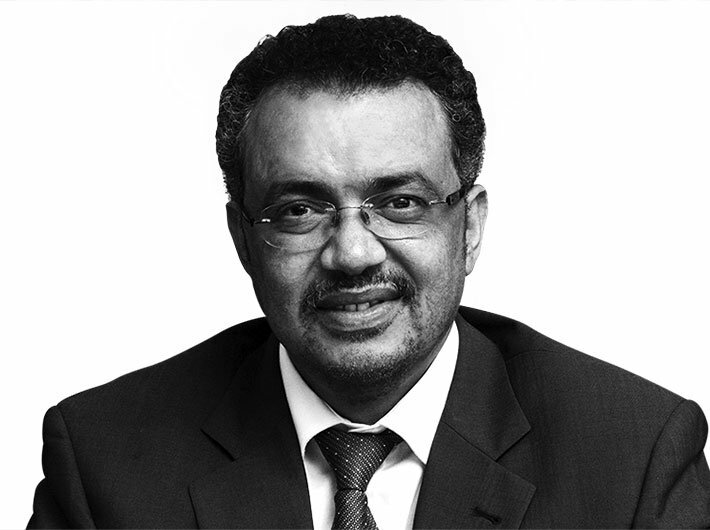 Tedros got 133 votes – though only 98 were required – finally defeating Nabarro. Tedros’s campaigning, however, was marred by heavy media attention, many a time negative highlighting his government’s role in human rights violations. “I like his demeanor & many of his priorities. But I don’t think the Ethiopian HR issue will just magically go away now that he’s DG,” tweeted Kristof Decoster from the Institute of Tropical Medicines and the editor of International Health Policies (IHP) newsletter. Before the elections, the New York Times ran a story that alleged that Tedros had covered up cholera outbreaks in Ethiopia by reporting them to the WHO as “acute watery diarrhoea”. However, Tedros found support from an unlikely source in Dr Tom Frieden, the former director of the Centers for Disease Control and Prevention and the US representative at the WHO EB meeting in January that chose the final three candidates, who argued that many countries choose to report cholera to the WHO as “acute watery diarrhoea” – something that can be reported without laboratory confirmation. Also, during the opening plenary, a freak incident of a man shouting slogans against Tedros, before eventually being escorted out by the security, startled the audience. But Tedros won. And won decisively. WHO is more important to our everyday lives than what it is given credit for. As such, there is a scramble for whose influence digs in the most given the UN agency’s wide-ranging mandate encompassing a plethora of stakeholders. From Nestle and Pepsi to tobacco company Philip Morris to Novartis and Cipla to governments, civil societies and the common person – all have a stake in the policies of the WHO. It is supposed to raise the alarm and guide governments through pandemics, direct governments on which essential medicines to keep in its stockpile, pre-qualifying medicines, recommending nutrition and dietary requirements, labelling carcinogenic substances, deciding which vaccines are recommended for infants, children and women, deciding which ailments are priorities to be tackled by governments, restricting how tobacco companies sell their products, among other responsibilities. It also helps other UN agencies and public health bodies procure pharmaceutical products worth billions by making producers and products go through a rigorous vetting procedure. Tedros, 52, who was the only non-medical doctor among the three candidates may soon discover that winning the election was perhaps one of the easier tasks compared to the challenges he may face in his five-year tenure, not least of which is drumming-up support for the grossly underfunded agency with its $4.4 billion budget. WHA70 approved WHO’s programme budget for $4,421.5 million for the biennium, including a 3 percent ($23.2 million) increase in governments’ assessed contributions for 2018-19. Assessed contributions form the core budget of the WHO, which is then free to allocate resources according to its priorities as opposed to voluntary contributions from governments and private companies, which earmark their money for specific causes, like the Gates Foundation contributing for polio work. Though the assessed contribution has increased after a long time, it is nearly not enough for the WHO to function smoothly. “So, the campaign has ended, as you know, officially, but I think more work begins, actually, now. And I know it’s very difficult. It’s going to be tough. It’s not going to be easy,” Tedros said in his first press conference after the election. To add to the global agency’s dire straits, the Donald Trump administration has been increasingly dodgy in funding multilateral agencies given the US president’s apathy towards money trickling out of America into the coffers of inter-governmental bodies. The US administration has issued an outline budget which has called for deep cuts in some of the global health agencies worldwide, as well as peace keeping, climate change, and other international bodies. The announced cut to US aid is 32 percent, to global health is about 17 percent and to scientific research institutes between 20 and 30 percent. What are the DG’s concerns going into his position for funding of the WHO, a Reuters correspondent in Geneva asked. “One the budget issue, I think it’s very important to move really fast in really addressing the budget issue. And when we talk about budget issue, most of the time we raise the WHO budget only. “But that’s not the right way of thinking about financing Global Health Agenda,” Tedros responded. He then spoke of a “bigger envelope” and diversifying the donor pool, of financing global health through the World Bank, Gavi and The Global Fund, creating a special office for funding like at the UN’s child agency and becoming less dependent on traditional donors. “But how in the world are you going to close a $2.2 billion gap, and whatever billions it turns out to be is lost with the United States leaving the field?” gasped another American journalist. “I’m a strong believer that there should be an exit strategy. Means gradual exit that avoids any shocks. Because when there is finance cut like this, the most affected are the poor, by the way,” Tedros replied and added there was a need for increasing assessed contributions. “While campaigning, I have been talking to some countries and willing to contribute, like what the US, UK and other countries do. You know, the voluntary contribution? There are countries who are willing to contribute,” the new DG said. But voluntary contributions, as mentioned before, bind the WHO to the donating government’s or private company’s priorities rather than the money being aligned to WHO’s priorities. “WHO’s own capacity to support national health systems remains weak despite their centrality, with most resources earmarked for specific diseases or programmes,” said a Lancet report. This was one of the many reasons for the debacle in WHO’s response to the Ebola crisis in Africa in 2014. The agency did not have enough money for preparing for emergency responses that came from assessed contributions. Nor was there a clear response from the DG on how he will convince governments to put in more money into WHO’s core budget. Additionally, it is detrimental to WHO’s cause of shoring up resources with the fact that it sometimes spends more on travel and hotel bills than fighting widespread life-threatening ailments. Associated Press recently reported that former DG Dr Margaret Chan had a $3,70,000 travel bill in one year, and recently stayed in a $1,008-a-night hotel in Guinea. It used $200 million a year on travel costs with its officials flying business class and staying in five-star hotels – and that adds up to more than it has reserved for fighting global health crises, added the report. The annual travel cost is more than what WHO spent last year in combatting AIDS, hepatitis, malaria and tuberculosis, combined. “WHO is nevertheless asking for more moolah to fight disease – and taxpayers will be footing the bill,” screamed a New York Post report. “Does it seem a bit misplaced that WHO staffers are able to travel business class when they are actually working for the poor?” asked another journalist to Tedros. While “reducing the overhead cost as much as possible is important… but when it comes to the travel cost, by the way, it has to be seen in relation to the programme, because any travel expenses or other costs, as long as they can be justified because of the programme, it’s fine,” Tedros said. Implementing universal health coverage (UHC), including enhanced access to medicines and vaccines, will be one of the major challenges though the DG has called it the “centre of gravity” for his proposed work during his tenure. “All roads lead to universal coverage. This will be my central priority,” Tedros said to the WHA plenary before his election. “At present, only about a half of the world’s people have access to health care without impoverishment. This needs to improve dramatically,” he added. Implementing UHC globally has been a priority area for the WHO since its creation in 1948, but there is a long way to go before that is achieved. Countries currently pursuing neoliberal economic policies, including India, are definitely neglecting health on a large scale, said an Indian journalist adding that health budgets are going down. The DG suggested that the WHO should not interfere, intervene and interfere in this since this is the government’s discretion. “Don’t you recognise that there is a responsibility as the head of the WHO to intervene in this debate? To say that public health investments have to keep up with the kind of disease burden that is growing in these countries?” the journalist asked. “As long as we agree on the goal, any government agrees on, you know, achieving universal health coverage, the means could be private, public, or a mix,” Tedros responded adding that WHO should advocate the outcomes not the means. “To secure medicines, the Director-General should champion the UN High-Level Panel on Access to Medicines’ recommendations. Furthermore, universal health coverage requires health workers…,” the Lancet report said. However, implementing the findings of UNHLP will be a tricky terrain given the acrimony of some of the biggest donors to the WHO towards the report. The recommendations aim to close the gap between health innovation and access and a call to double the funding for R&D to US$6 billion per year. The pressure from drug companies to maintain high prices was most recently exemplified during a resolution on cancer drug pricing that health activists have said was considerably “watered down”. “Under pressure from drug companies to avoid controversy this week, negotiators eliminated text that called upon the WHO [to] do a feasibility study of ending monopolies on cancer drugs, and addressing transparency of drug prices, R&D costs and access gaps,” James Love, director of Knowledge Ecology International, said at a press conference during the ongoing WHA session. “But what remains does give the new DG, Dr Tedros Adhanom Ghebreyesus, a sufficient mandate to do all of this, and the issue of de-linkage for cancer drugs is being taken more seriously,” Love said. The fact that DGs can run for a second term – carrying the obligation to keep all governments, and in particular the more powerful ones, happy – may act as an informal constraint on the choices that a WHO chief makes during his or her tenure. Perhaps, it is time to consider whether rules should be changed to restrict a WHO chief to only one term in the interest of better global public health. The former Ethiopian health minister has an impressive track record in working with flailing health systems and especially in combatting AIDS, malaria and tuberculosis in his country. One hopes that the informal pressures cited above do not affect his choices that affect the lives of millions of the global poor.